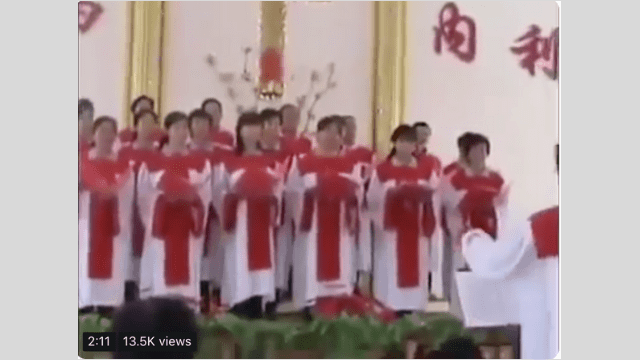 Churches across China are forced to sing songs praising the Communist Party or else believers would be prohibited from gathering. According to eyewitnesses, police officers stormed into a government-controlled Three-Self church in Taihe county of Fuyang city in Anhui earlier this year and ordered the church choir to sing a so-called “red” song in praise of the Communist Party. A 72-year-old member of the choir refused to sing. “This isn’t a song in praise of God, so I don’t know how to sing it,” she said. A police officer shoved her and ordered her to leave the church. Another Three-Self church in Fuyang’s Linquan county was forced to add patriotic propaganda content to its sermons and sing songs praising the Communist Party. In Longtan village of central Henan’s Sanmenxia city, in July this year, local party cadres stormed into a Three-Self church, and ordered believers to face the national flag and sing red songs, or else the church would be closed down. The officials sat at the back, listening to and monitoring the believers; some of them were taking photos. The same month, authorities from Hualong district in Henan’s Puyang city demanded members of the Xibaicang Church to sing “red” songs and rehearse dances to welcome an inspection. Similar incidents occurred in northern China. This July, members of a Christian church in the Lingdong sub-district of Liaoning Province’s Tieling city were forced to sing Socialism is Good, Sparkling Red Star, and other popular red songs. According to some reports, local governments across China have instructed Three-Self churches to hold patriotic song competitions, and places of worship of other denominations, such as Buddhists, have also been forced to perform “the songs in praise of communism. At the same time, Canaan Hymns, widely sung in Christian churches throughout China, have been prohibited by the authorities. Leaders of churches in Henan, Zhejiang, and provinces in northeastern China have reported on numerous cases when officials confiscated Canaan Hymns from homes of believers or churches and burned them. “Red” songs have always been a form of propaganda used by the CCP to promote its ideology, even abroad. An adaptation of opera The Red Guards on Lake Honghu from the times of Mao Zedong that sings praises to the bloody history of the CCP is scheduled to perform in Sydney and Melbourne in early November.